Educational programmes in prison are ‘generally considered to have an impact on recidivism, reintegration and, more specifically, employment outcomes upon release’ (Special Rapporteur on the right to education, Vernor Muñoz). Nina Champion, Head of Policy at Prisoners’ Education Trust, looks at the importance of prison education and the increase in and impact of prison university partnerships around the world. ‘There is a growing recognition of the need to equip prisoners with the skills and education needed to obtain work on release’, PRI noted in its 2017 Global Prison Trends report. I have worked at Prisoners’ Education Trust (PET) for six years influencing policy and practice. Over that time I have seen prison education rise up the English political agenda. Following a 2016 review led by Dame Sally Coates, this year governors will take control of prison education budgets, giving them the flexibility to better meet the needs of their individual populations. It is therefore a vital time to see what good practice can be learnt from overseas. These findings were echoed in research conducted by the Ministry of Justice (2015) in England which, through analysis of data from PET, found that people supported by PET to study distance learning courses in prison, including the Open University (OU), were a quarter less likely to re-offend than a matched control group. As part of the Steering Committee for the European Prison Education Association (EPEA), I helped to organise a recent conference held in Vienna. Coming just after the International Day of Education in Prison, the conference showcased ways in which countries are implementing the Council of Europe recommendations on prison education, from innovative arts projects to supporting foreign nationals, despite the various structural, political and resource barriers they face. A roadmap for countries to navigate those barriers is available in an excellent new publication by the United Nations Office on Drugs and Crime (UNODC). ‘I have learnt that it is not necessary to have the same opinions, you can look at something in different ways’, one Danish Inside Out learner explained. A Belgian prisoner said studying alongside outside students ‘made us feel more human. It is impossible to explain how much we appreciated this’. It’s not just in Europe and the US where such collaborations are growing. The work of the African Prison Project supports prisoners to get Law degrees in Kenya and Uganda. There is also a growing trend of prison university partnerships in Australia and South America. Wherever you live in the world, prisons are part of our communities and most people in prison will one day be released into those communities. Colleges and universities are also part of our communities and can help successful re-entry into society. As Professor Reese, founder of the Prison Education Project that I visited, noted, there is a community college and/or university within a 30-mile radius of the majority of prisons in California. 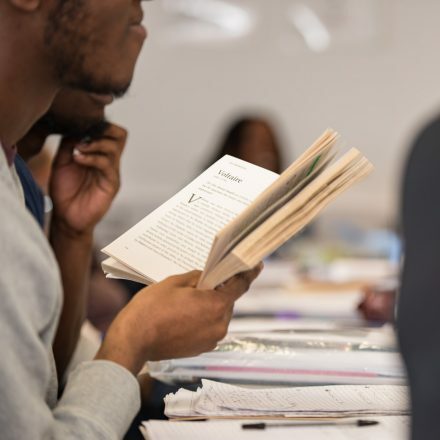 With this is mind, since 2011 Reese has mobilised 800 university student and staff volunteers to support and inspire over 5,000 prisoner learners (Reese, 2017). A Belgian prisoner said studying alongside outside students ‘made us feel more human. It is impossible to explain how much we appreciated this’. Therefore, my new year wish for prison education in England is that, with their new-found freedoms, Governors ‘break out of their silos’ to make contact with local universities and explore what collaboration could offer to staff and students on both sides of the wall. My Fellowship report will be launched at a PET symposium on Prison University Partnerships, which will be held at the University of Westminster in London on 20th April. If you are aware of, or interested in setting up, a prison university partnership, or know of innovative prison education in your country, I would love to hear from you (nina@prisonerseducation.org.uk). Rule 104 of the Nelson Mandela Rules (the revised United Nations Standard Minimum Rules for the Treatment of Prisoners) states that ‘learning opportunities should be provided to prisoners. Classes offered should be of the same level as the community education system and available to all prisoners.’ Read our short guide to the Nelson Mandela Rules here, or watch a two-minute animated introduction to the Rules. Nina Champion is Head of Policy at Prisoners’ Education Trust (PET) in England. She is on the Steering Committee for the European Prison Education Association (EPEA) and is a Winston Churchill Memorial Trust Fellow exploring international prison university partnerships.